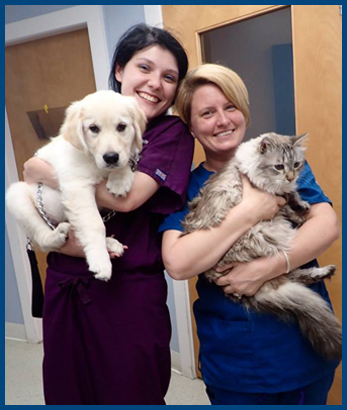 The staff at Noank-Mystic Veterinary Hospital is committed to providing pets and pet owners the finest veterinary care possible in the greater Norwich area. We want to become known as a welcoming, skilled and cost-conscious partner in the care of your beloved companions. While we primarily see dogs and cats, we also treat exotic pets, including various avian species and waterfowl, rodents, pocket pets, rabbits, reptiles and others. We strive to remain on the cutting edge of veterinary and client care, which includes a recent major renovation of our facility. Our animal hospital features a state-of-the-art surgical suite, updated treatment areas, an in-house lab, and more. We're more than just a building and equipment. The entire staff is committed to providing quality care and promoting client education and responsible pet ownership. We work with you to understand your pet's healthcare needs and develop a preventive care plan that best meets those unique needs. We have found that when your pet receives regular and routine wellness exams, vaccinations, proper dental care, and screening for common diseases, they have a much better chance of living a long and happy life. That's our approach. A beloved pet may still develop an illness or be injured. Our internal medicine and surgical expertise, as well as advanced diagnostics, ensure your pet receives a thorough and accurate diagnosis. We explain the diagnosis to you as well as the various treatment options. We always partner with you in the care of your pet. It is our goal to provide you and your pet with the very best veterinary care possible in a modern and welcoming facility, administered by a staff that is kind and courteous. Please take a look at the services we offer and learn why we believe they are important to the care and wellbeing of your pet. Then give us a call to set up an appointment today! We are raising the bar on the standard of care.